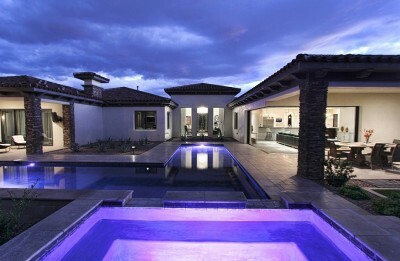 Soft Contemporary Custom Residence boasting over 6,000 sq. ft. of casually elegant living with 5 Spacious Bedrooms including a Casita, 5 ½ Baths, and 3 Car Garage. Warm and Inviting interiors open effortlessly through a private Courtyard entry. An elegant foyer with beautiful travertine flooring announces the formal living room with custom hand crafted built-ins, and large picture windows overlooking the sparkling pool and outdoor entertainment area. This immaculate home features modern finishes including master crafted millwork, knotty alderwood doors, Venetian plaster, Nest Thermostat Controllers, and Restoration Hardware Lighting which complement the exquisite architecture. The Modern Chef’s Kitchen has a large center island, breakfast bar, slab Caesar stone counters with glass tile backsplash, professional grade appliances, and butler’s pantry. The Dining Room features a barreled arched ceiling with brick inlay and a temperature controlled wine cellar. The Spacious Family Room is highlighted by an impressive fireplace with floor to ceiling limestone surround, distressed hardwood flooring, and large scale disappearing glass doors opening to the private back yard oasis. A Grand Master Suite showcases a cozy fireplace adorned with floor to ceiling limestone, rich wood flooring and French doors opening to the covered patio. The Opulent Master Bath features a beautiful limestone and glass tile shower, a soaking tub, limestone topped vanities with dual sinks, and travertine planked flooring. This luxurious estate boasts dramatic exterior amenities which offer abundant space for outdoor living and entertaining including a large pool and spa, fire pit, an outdoor kitchen, bocce ball court and mature landscaping. For more information about this property please visit Portfolio Realty Group or contact us at (702) 726-6772.